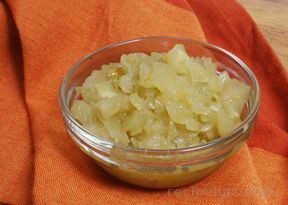 This chutney was developed by me before a noon television segment on healthy eating. 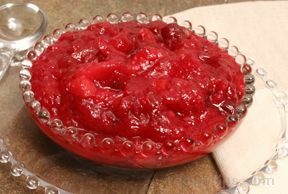 I wanted to include cranberries and not just a typical side cranberry relish. I wanted to include the berries along with some dried cherries, both of which are high in antioxidants and fibers. I then added some walnuts. Cooking the ingredients in a pomegranate juice with port gives a richness of flavors that is only believed by eating with cheese and a cracker. In a large saucepan, mix port with the two juices; bring to a simmer. Add cranberries and bring quickly to a boil; reduce to a simmer; cook until skins begin to burst. 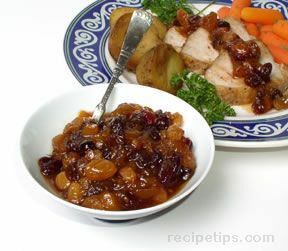 Add dried cherries to cranberries; allow to simmer for five minutes. Remove from heat. Stir in orange zest.